Week 29 had me all over the place. 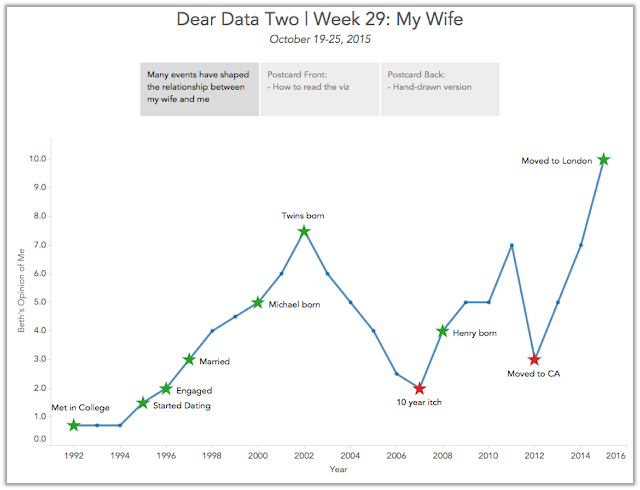 The topic of “my wife” was so broad that I had a bad case of analysis paralysis. Should I track her movements? Should I ask her to track something? Should I analyze all of the wonderful pictures she’s taken? Should I do a word analysis of her blog? I then had a chat with my boss, Tom Brown, and in his Tom Brown way, he said that I should simply track the number of wives I’ve had over time. Well, I went with that idea and added a twist. 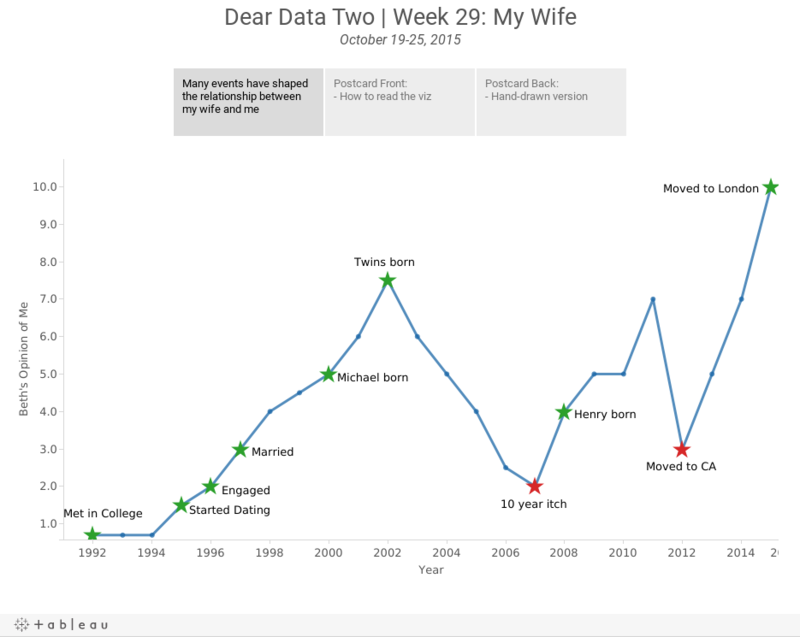 At our #DATA15 presentation, I talked about the wife KPI, so what I decided to do is create a chart of the wife KPI since Beth and I first met in 1992. From there I added major milestones to the dataset, categorised those event as positive or negative, then built a simple line chart. It's really interesting to me to see the ebbs and flows of our relationship. I would have never noticed it if I didn't see it depicted on a graph this way. Note that on this postcard, I intentionally used red/green to indicate bad/good. I preach to people not to do this if they don’t know if their audience is colour-blind. In this case, my audience of 2 (Jeff and my wife) are not colour-blind, so I knew it would work. She hasn't said a peep yet Kevin, so either she hasn't seen it, or agrees with me 100%. I'm going with the former.